What do frogs gossip about? Quite a lot, it would seem! This gorgeous figurine is based upon artwork by Amy Brown. 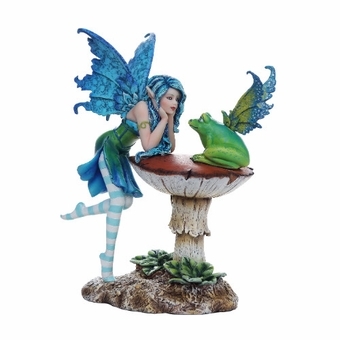 A pixie clad in blue and green, with indigo wings and hair, engages in an intense conversation with a winged frog! The piece is a wonderful addition to any faery lover's collection. Size: 6" x 3 1/4" x 7"